Star Wars Fan Builds Millennium Falcon Guitar! I can’t say this appeals to me, as I am not a Star Wars fan but you have to hand it to the guy for his originality. 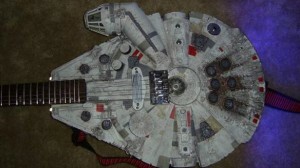 Using an electric guitar and a vintage Millennium Falcon toy, Travis S. managed to build a unique instrument shaped like Han Soloâ€™s starship. Having built guitars with his father, in high-school, this was a relatively easy task for Travis S., but the idea of building something that has never been done before appealed to him. An avid Star Wars fan, with a sizable collection of memorabilia, he decided to combine his love for the sci-fi franchise with his passion for guitars. It only took him a month, working on weekends, to complete the guitar, but he says he could have completed in under a week. Since this is an electric guitar, using a plastic toy as the body doesnâ€™t affect the way it sounds, but the artist had to add a maple block from the start to the end of the ship, to keep it from breaking under the tension of the strings. The back of the Millennium Falcon guitar has been fitted with blue LED lights, powered by their own batteries. Despite its futuristic look, the guitar was designed to play, and I can only imagine the reaction from the audience when Travis brings this one out to play!